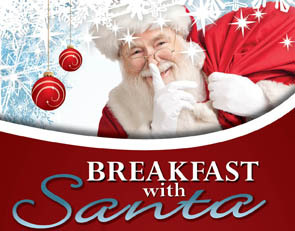 Breakfast with Santa will be held on Saturday morning, December 22 from 9:00 a.m. – 11:00 a.m. Join us for food, fun, crafts and Santa! There is no fee but registration is required. Please sign up using the form below. Teen assistants (grades 6-12), please be sure to sign up for Friday night set up (and pizza and movies) from 7:00 p.m. – 10:00pm. Be sure to scroll down and fill out all the fields. Once completed, don’t forget to click the Submit button.